This Tudor Revival style building has two stories, a wood shakes shingle roof and is intact. It has arched roofed dormers; a stucco front wall chimney on projecting front ell; 3 stone interior chimneys; a small front entrance vestibule with a steeply pitched gable; sets of 3 windows with transoms, some diamond-paned leaded glass windows; early gambrel-roofed extensions; a 1-story conservatory ell with French doors off left (east) side; and a faceted 2nd story oriel on the south side. It is landscaped with many mature trees & shrubs; wood picket fence & row of evergreen trees along Greenwood St. right-of-way and arched arbor at the entrance. There is a stone retaining wall supporting a patio at 1st floor level on rear (south) side of house. This does not appear to be the original 1820 style building – Tudor Revival style is the result of much more recent renovations in early 1900’s. Hillside was built by Mrs. Hartman (Grace) Kuhn of Boston in 1870, and used by her during the ‘season’. 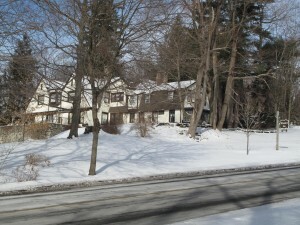 Mrs. Kuhn, who also purchased Butternut Cottage, owned the entire lot along Main St. from Greenwood to the Kingsland House (at the junction of Main and Cliffwood Streets). By 1890 the house was being rented to Mrs. Cruger of New York, and around 1911 it was sold to Mr. and Mrs. Ross Whistler, who renamed it Hidden House. Today it is “Whistler’s Inn” owned by Richard and Joan Mears since 1978.